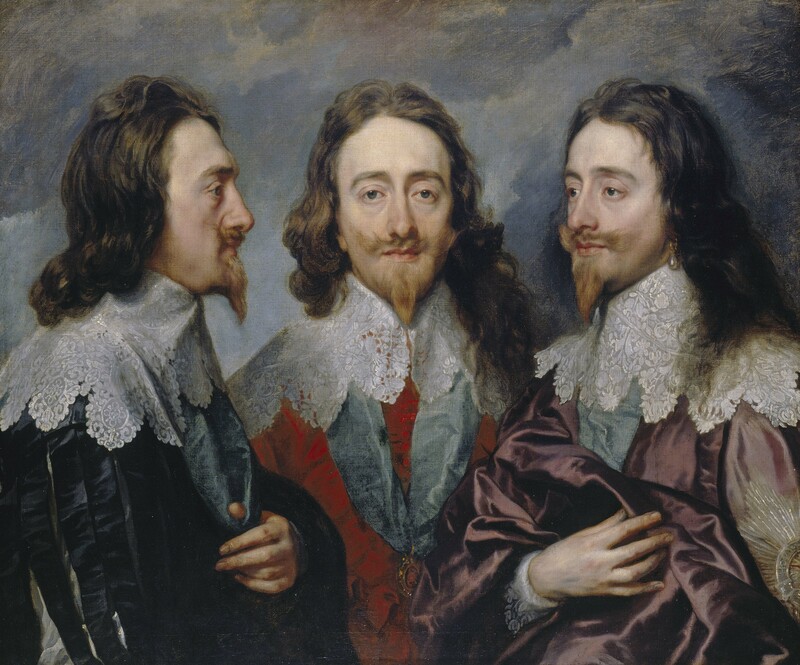 Charles I’s favourite contemporary painter was Sir Anthony van Dyck. Shortly after being lured to England in 1632 he was appointed ‘Principalle Paynter in Ordenarie to their Majesties’. His status as an artist was the equivalent of being a celebrity. He was a gentleman with courtly manners, knighted by Charles, given a pension, and given a house at Blackfriars so that King could conveniently sail down the Thames from Whitehall to visit him. The painter’s role was simple; to promote Charles’ image to the world as an absolute monarch, and to bring about a new style of art that would become synonymous with the new Stuart reign. Both were to be reflect the power and wealth of the new King, and to compete with the courts of Europe. This study done for the sculptor Gianlorenzo Bernini was not supposed to be a work of art to be framed and admired, it was a tool for Bernini from which to create a portrait bust in marble. In these three views of the King’s head we see what van Dyck saw in Charles. Face on he looks tired, slightly vacant and sad. His heavy-lidded eyes have bags under them. The King’s lace collars are depicted with painstakingly detail, and the regal purple colour of his clothing on the right is painted with astounding virtuosity. Painting of this mastery had not been seen before in England, and van Dyck’s presence was to prove revolutionary in an art historical sense. Being the creator of the King’s vision and the most fashionable painter at Charles’ court, van Dyck set a new standard for portraiture and was widely imitated. So seismic was his influence that its impact can be felt through to the 19th century with artists such as Sargent. One of the most decisive moves in the King’s career as a collector was the acquisition of works from the Gonzaga family of Mantua. Flemish merchant and dealer Daniel de Nijs hinted to Nicholas Lanier, Charles I’s Master of Music and respected art connoisseur, that some of the Gonzaga collection may be up for sale. Negotiations began in 1626, and a deal was finally made in 1628. Six generations of the family had amassed one of the greatest art collections in the world, having the finest examples of just about everything. During the two years to took for the purchase to happen two of the more art-oriented Gonzaga Dukes had died and the need for money had become more pressing. The deal was to prove momentous for Charles I, but it also shows the astuteness of his agents abroad, how they seized opportunities to help build the beginnings of the Royal Collection. Lanier, who was given carte blanche, acquired paintings by Bronzino, Tintoretto, Bassano, Giorgione, da Vinci – basically all of the Renaissance masters. Exquisite and important examples of Ancient Roman sculpture such as this, Aphrodite, or ‘The Crouching Venus’ from the 2nd century AD, were also purchased. As a popularly copied Greek original it shows the influence of the Hellenistic archetype of the goddess of beauty and love. De Nijs described it as ‘the most beautiful of all [the Gonzaga antiquities]’, and in the flesh it truly is stunning. 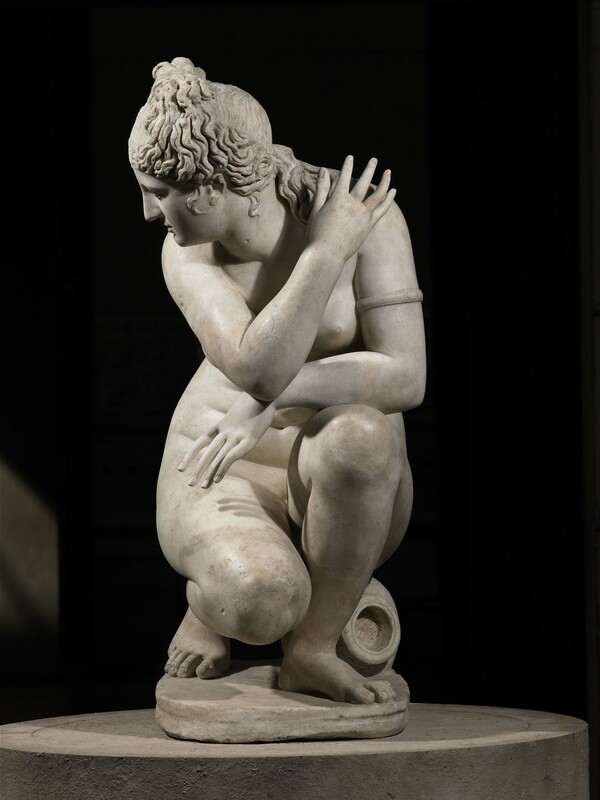 Startled whilst bathing, Aphrodite or Venus crouches, drawing her arms around her body to cover herself. In positioning her this way the unknown sculptor allows us to look upon the goddess whilst she is distracted, her body is posed to show her voluptuousness whilst appearing modest. Rubens saw this at the Gonzaga court and found it inspiring, using the pose in Allegory (1612-13). Interestingly, it was brought by the painter Sir Peter Lely at the Commonwealth Sale at Somerset House a few months after Charles I’s execution, but was later returned to the Royal Collection. 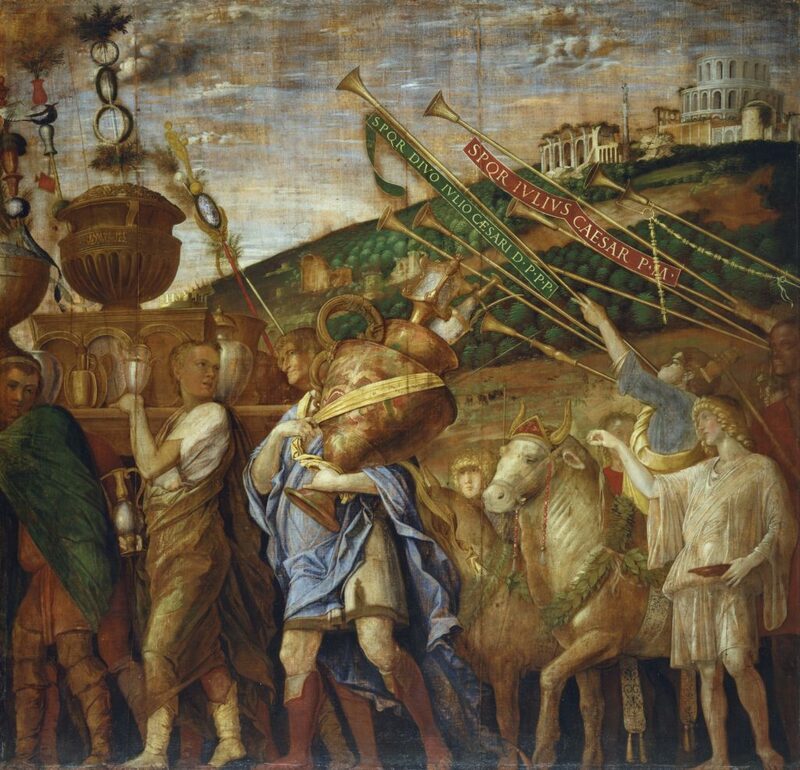 Among the jewels from the Gonzaga collection were nine paintings by Andrea Mantegna, The Triumphs of Caesar, displayed in a gallery of their own. The series was a key piece for the ducal family who modelled themselves on the Caesars of Ancient Rome. Ironically, they depict the spoils of war, brought from the Gonzaga for Charles’ collection, which would later be plundered by Oliver Cromwell. In a fortunate twist of fate, Cromwell kept the Mantegnas for the State, and they have remained at Hampton Court since they were brought to England in the 1630s. Perhaps the military theme appealed to him. Although the nine panels were not well preserved, and are very dimly lit, we get a sense of the monumentality that they would have impressed upon a 17th century viewer. I think these paintings would have resounded with Charles I as he brought art into the country, including Ancient Roman objects, as he obtained masterpieces and luxury goods from European collectors. In 1623 Charles went to Madrid with the aim of wooing the Spanish Infanta. Despite spending eight months there he failed in his mission, but he left Spain with love of a different kind. The art collection owned by King Philip IV, was one of the grandest in the world, and the young King would have been enamoured with the drama, sensuality of the Renaissance and Baroque paintings he saw there. Housed in the magnificent El Escorial was around 1000 paintings (just half of the entire Hapsburg collection) by the greatest Old Masters, including some of the most important works Titian. Art and architecture was a means through which the great European courts expressed their dynastic authority and dominance. Collecting art was as much a political and cultural activity as it was one of personal interest. England was behind the times, but this visit to Spain was the inspiration Charles I needed to create a culture of his own. In 1625 he married Henrietta Maria of France (daughter of King Henry IV and Marie de’Medici), an unpopular choice with the English people as she was Catholic. However, Henrietta Maria’s role in the formation of the collection was important. She was a keen patron of the arts and her family name was Charles’ key to the European courts and the members of it. 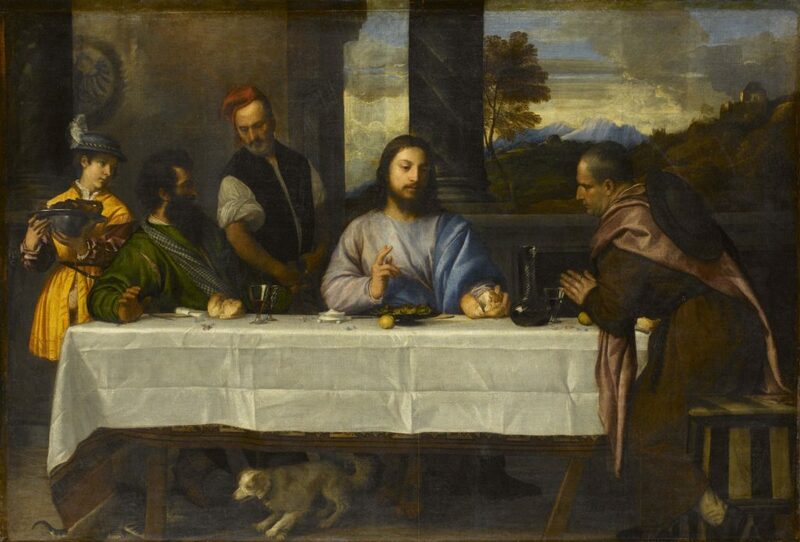 The Supper at Emmaus (c.1530) by Titian is one of my favourite paintings in the exhibition. The enormous canvas depicts the moment when Christ is revealed to two pilgrims as he blesses the bread and wine. Charles I brought his first Titian after visiting Spain, and he quickly became one of his favourite artists. Although Michelangelo, da Vinci and Raphael were seen as pinnacles of Renaissance art, it was Titian that captured Charles’ imagination. This painting typifies Titian’s unique use of colour, ability to work on a vast scale and portray a diverse subject matter, qualities that must have appealed to the King. This was something he had in common with van Dyck and his master Rubens. Both artists absorbed the Venetian’s manner of painting in a grand, poetic way that appeals to the senses through light, colour and texture. In particular, Titian’s characteristic free brushwork was hugely influential. I love the small but poignant gestures in this painting; Christ’s fingers raised in blessing, the hands of the pilgrim on the right answering in a sign of prayer, the inn keeper’s face turning away, the cat and dog scrapping under the table. It is grand and monumental yet retains a graceful realism. This unprecedented exhibition demonstrates the formation and establishment of Charles I’s taste, and how it has resonated through history. The importance of art he commissioned and collected as an enterprise cannot be underestimated. He laid the foundation of the Royal Collection, and what is now the greatest collections of art in the world is indebted to his passion and ambition. The 150 works reunited at the Royal Academy (more than 80 from the Royal Collections Trust) cover the 15th – 17th centuries create an exhibition so powerful that it is easy to appreciate how discerning and astute a collector Charles was. He hung his acquisitions throughout his royal palaces, both on display to impress his visitors and for personal enjoyment in his private rooms. What strikes me most is not the ambition, status and political manoeuvres that are manifested in the art works, but his connoisseurship and true love of art.